This note was motivated by and part of my goal to better understand Rohde et al's modeling work in the 2004 paper "Modelling the recent common ancestry of all living humans". My initial current steps are described in this blog post. In this post, I am focussing on the mortality model used in Rohde et al's work. There were a few more steps than I had realized (relative to my own unfamiliarity with actuarial methods), and I wanted to dive in a little bit. "...the death rate, β, was raised to 12.5 for the purposes of the model. This produces an average life span of 51.8 for those who reach maturity." Based on the derivation below for the needed quantities, I am currently getting 51.866. Note: This is a work-in-progress. I could be off-by-one in the equations below based on the interpretation of "death at age s" vs "death by age s" kind of thing. where the parameters and the values used are shown in the following table. While in Rohde's model you can use this formula to determine the probability that a "sim" of a given age dies, you can also calculate other summary statistics without need for simulation. This is because when calculating any statistics, you must first specify at what age are you are starting. 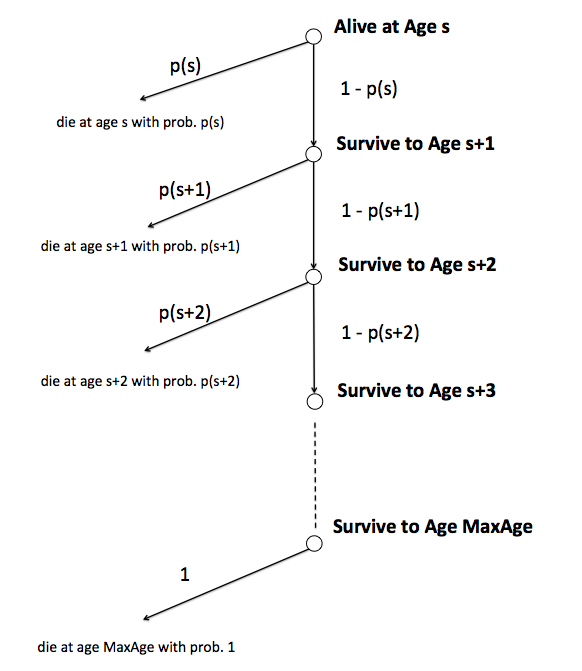 The "survival tree" figure above, inspired by that in the Wikipedia page on life expectancy, shows how the mortality probabilities are used sequentially. where the sum that is multiplied by $s$ sums to one because the sim must die at one of those ages. Obviously, one could remove the first term in the sum. After a bit of tedious thrashing, I think this might be correct. Note that this rederivation is I'm sure a trivial thing for those familiar with actuarial concepts and techniques. When using the parameter values reported in Rohde et al in the equation for expected lifespan for those who reach maturity ($s=16$), I get a value of 51.866. Is that the same as 51.8? I don't know if he truncated instead of rounded, or I am wrong. It seems pretty close. Note that as for my running of the population model itself, the average lifespans for those reaching maturity in a given simulation is consistently slightly higher than 51.8. This could be due to any number of trivial issues with my implementation, and I hope to be looking at that later. I also noticed that the following equation seems to yield the same result for expected lifespan. There must be some simple algebraic collapsing going on.... or I am wrong.